What could be better than enjoying 4 weeks in sunny Costa Rica during the summer and actually...anytime during the year? ILISA offers the possibility to book a complete package that includes: Spanish classes, homestay, cultural activities during the week, study materials and weekend excursions. In this intensive program, students will be enrolled in language classes from Monday to Friday for four hours per day plus multiple activities around the country. Classes will be determined by the student’s level of proficiency. Spanish classes are offered at all levels. Students can participate in the program for 1,2,3 or more weeks. The classes start every Monday during the whole year. Please contact our booking/enrollment department for more information and for registrations. During the month of June ILISA was buzzing with life. We had groups of students from Atlanta, Saint Petersburg, Charlotte, Tampa and other places doing their Study Abroad Programs with us. We had a lot of fun with them not only at the school, but we also went on great trips to the both coasts, rainforests, volcanos, coffee plantations and enjoyed as much of the country as we could. This all made a memorable and lifetime experience for all of us and we believe that the students will be coming back to Costa Rica. Our Study Abroad Programs include Spanish classes according to the University/Student's needs, cultural activities during the week (concerts, museums, dance/cooking classes, soccer and other activities), homestay with local families, airport transportation and possible weekend excursions can be added. The Institute for Economics & Peace measures peace at the global and national levels to rank and access the political, economic and social factors that creates and facilitates peace. Every year the Institute for Economics and Peace collects access and produces a Global Peace Index ranking 162 countries according to their levels of peace based on the factors previously stated. The index factors 23 qualitative and quantitative indicators from various and respected sources and ranks 162 countries, covering 99.6 per cent of the global population. The index uses three primary premises, looking at the countries societal safety and security, levels of domestic and international conflict and the level or degree of militarization. 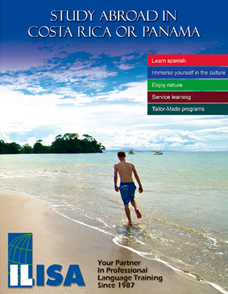 If you were not sure whether it is safe to come Costa Rica, now you can leave your worries at home and enjoy this beautiful country while studying Spanish. Plantains are very popular and easy to get in Costa Rica. This fruit, that belongs to the Banana family, can be baked, fried or mashed and can accompany basically any kind of a dish. Here is a recipe how to bake them. Directions: Place plantains in a glass cooking pan. Top with sugar and cinnamon. Place sour cream and cheese along the split. Cover with aluminum foil or banana leaves. Bake at 350° F (176.7°C) for 10 minutes. Uncover plantains and bake until golden brown. Remove from the oven and let cool. Add more sour cream and cheese to taste. Dennis, our entertainment coordinador, takes our students to the museums, theaters, train rides and organizes all different kinds of activities. This month our students had a chance to enjoy San Jose downtown walking tour. We like languages a lot, but we also like to explore new things with our students. That's why we organized a fruit tasting this month to discover new flavors, shapes and colours. ILISA is all about discovering Costa Rica. A group of students from the University of South Florida went to Rincon de La Vieja to enjoy their free weekend of their 5 weeks of Study Abroad Program. We had a lot of fun. PURA VIDA!